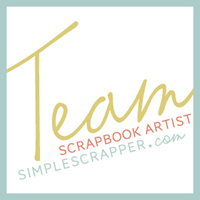 Simple Scrapper: Just 1 More Photo?! The idea for this layout came from a photo prompt in Simple Scrapper's May Story Starters and the design is based on a sketch template from the Premium Membership collection. This is an 8.5x11in layout but that's not how it started out, or originally finished actually! I think the difficulty I had with this layout is the photos were so big and dominating when I really intended them to be a supporting act to the story. If I was to make this layout again I would use the photos as an 8.5x11 base, layering a sheet of vellum over the top and building up there there. Ah well, next time. It's Sunday evening and tomorrow I head back to work after 10 days off. I've knitted, read, scrapbooked, ate cake, had lunches with BoyF, saw a movie with a friend, watched (too much) daytime TV, borrowed a Citroen and went for a drive, bought a lamp, visited display homes, baked hot cross buns, ate chocoloate, went to the football, had dinner with Mike's family as well as with friends, watched a season of The West Wing, gardened, tracked down a food truck and saw a comedy festival show. And I've done lots of nothing. Day 23: My last working day of the year and a moment of under-caffeinated inattention resulted in me getting booked by the public transport ticket inspectors. Not how I wanted the day to go, there might even have been a few tears. In the afternoon I went Christmas supermarket shopping so I included my shopping list and receipt. Day 24, part 1: My first day of holidays! I've included a Christmas Countdown card from Studio Calico and a photo of friends we had over for lunch. The present photo is backed with vellum. Day 24, part 2: Christmas Eve ended up at 3 pages because of the idea I had for this full page layout. Not quite sure why I didn't just go with two full page layouts. Left: The selfie was a real favourite of mine when I snapped it. As I used the front camera on my phone, it was low resolution so I printed it out small. The tree decoration photo ended up a little shorter than the card on the back, so I sliced through the photo to extend it and added my journaling strip over the gap. Journaling reads - Enjoying a cappuccino on an early morning trip to buy fresh bread. Catching up over cruisy Christmas Eve Mexican feast with Liz and Dave. Dressing up Julie's present with a booklet of photos and suggestions. Pottering around the house and taking countless photos of our Christmas tree. Love that lazy holiday feeling. Right: I created this page in Photoshop Elements, just adding the little photo of BoyF and I on popdots after printing. The journaling is taken directly from a blog post. It's a simple page - I decided again adding any embellishment - which supports the story of a quiet house and will contrast with the chaos of Christmas Day to follow. Next up, documenting Christmas Day. During a break in the rain after lunch, Mike headed outside to hide the eggs for our traditional Easter egg hunt. They were in pots, on the fence, tucked into trees, perched on the apex of the shed roof, there was even an egg inside the old 205. For the first time, Good Friday was also my cousin Sam's birthday. He turned 17 that day, so of course we had to make a fuss! Our Save the Date cards have been sent. I pretty much adore them. As BoyF and I had known each other for 20 years before we started dating(!) I wanted to have some fun with that. My sister Jenna designed a timeline which we hole-punched to be a feature on the front and back of the card. The year we were born, first met, began dating and are getting married. There wasn't a lot of information to include so we went small. Petite. I think they turned out so cute! On the weekend BoyF and I saw the movie The Monuments Men (really enjoyed it). Our conversation after made me think of here, the Okopowa Street Jewish Cemetery in Warsaw, Poland. It was one of the most haunting places I visited in Europe. Reclaimed by forest, headstones broken and in disarray, the cemetery tells of community that disappeared. I've never had much luck growing vegetables and herbs. (In fact, the only plants that have ever thrived for me are the roses in the front yard and I basically just leave them alone.) But I love cooking with fresh herbs and picking them straight from my garden gives me such a thrill, I keep trying. I've even included a 30 Before Marriage goal of eating produce from our garden. Passed on past abilities, that's optimistic. A few weeks ago I planted some pea seeds, as well as basil and snowpea seedlings. When those seeds first sprouted, gosh it felt like an amazing achievement. Then I planted carrot, onion and spring onion seeds and eagerly watched them. I mentioned to BoyF that I wished I had a veggie patch in the sun and the next day he built me a new garden bed. That night I planted rows of spinach, lettuce, beetroot, celery and radish seeds. 2. Blog topics. What should I post about? Ummm... Posting has been a bit sparse recently, in part due to lack of time/conflicting priorities but also a lack of inspiration. And, I spend way too long umming and ahhing over words and need to develop a better routine. If anyone has a topic they'd like me to blog about, feel free to suggest it in the comments. 3. Holiday plans. In 9 days I will have 10 straight days without work and I can't wait. Can't wait. BoyF has suggested we go away for a few days, and we might, but the idea of simply hanging around home and pottering sounds wonderful. 4. Blog design update. I've been meaning to make some design changes for quite a while and I've finally started. A new blog banner is complete but I'm fighting with the side column; can't decide what information to include and how. 5. To Do List and my Want To Do list. Engagement Party photobook, started but not complete. December Daily album, started but not complete. Week in the Life pages, photos ordered and delivered but not complete. I've ordered more wool (lots of colours) to knit a new cowl but my dark yellow scarf is not yet complete. (Yes, there is a bit of a trend there.) Sort through cupboards and drawers to cull and reorganise. Bake hot cross buns. Go to the movies. Plant in my garden. And suddenly those 10 days without work seems awfully short. What thoughts are distracting you today?